version of gluten-free and dairy-free Bakewell Tart can be made with or without ground almonds. The almonds give a firmer texture to the Tart’s filling but either way is delicious! Preheat your oven to 375’F / 190‘C / Gas 5. Lightly grease a shallow pie dish. 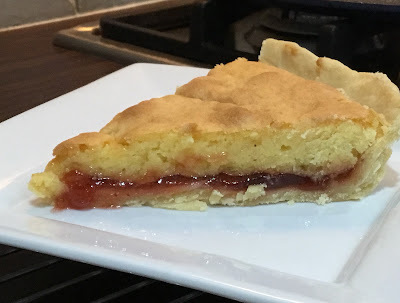 Line the dish with your pastry and spread a thick layer of jam over the base, about 0.5cm thick. In a medium bowl, thoroughly mix all the other ingredients together and then carefully spread over your layer of jam. Bake in the middle of your oven for 25-30 minutes until the filling is set. Serve warm or cold with a dairy-free cream, dairy-free ice-cream, dairy-free custard or dairy-free vanilla sauce.